Save our mother earth! Give your green earth campaign a significant boost with our earth slogans for kids & adults. 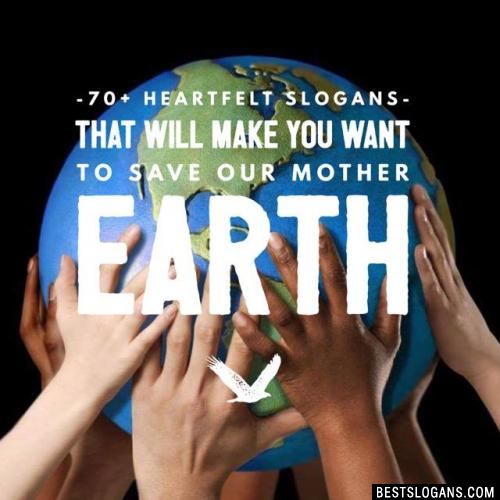 We've gathered the absolute best slogans, quotes, sayings & ideas on saving our green earth. A single quart of motor oil dumped on the ground or in the trash, can contaminate up to two million gallons of fresh water. Americans dump 16 tons of sewage into their waters, every minute. Up to one half of all plants and animals species on dry land could face extinction by the year 2050 due to global warming. Earth is a very important part of our lives. Most of us wouldn't think of polluting our bodies, yet we are polluting our planet by misuse and overuse of our natural resources. 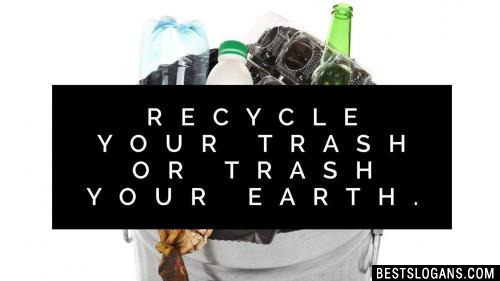 As responsible individuals we should at least do what we can to help reduce, reuse, and recycle what we can as a first step. We are not completely to blame; we inherited a polluted Earth, but we can do something to ensure that our children can grow up in a cleaner, safer planet than ourselves. Don't ever let someone get away with saying "what can I do, I am only one person". Each and every person can do a lot, and you can influence others to do something as well. 1 Celebrate life on earth every day... in every way. 2 Earth Day is every day! 3 Love the earth...it's the only planet we've got! 4 Live every day like it's Earth Day! 6 When you refuse to reuse it's our Earth you abuse. 7 Green earth, clean earth is our dream worth. 8 Keep the Earth clean, it's not Uranus. 9 Recognize the value of earth and start caring it from today. 10 Don't be sorry for past but do seriously for better future. Save earth. 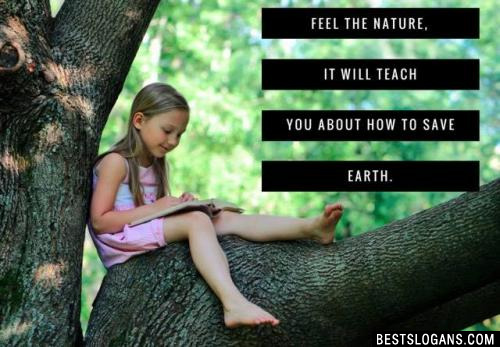 Feel the nature, it will teach you about how to save earth. 12 God has blessed us with nature to fulfill our need but not our greed. Save the earth! We have no other known place to live in this universe. 14 Earth is our mother; we have to save our mother. 15 Serve heartily to conserve earth originally. 16 Green and clean earth will bless you with longer life. 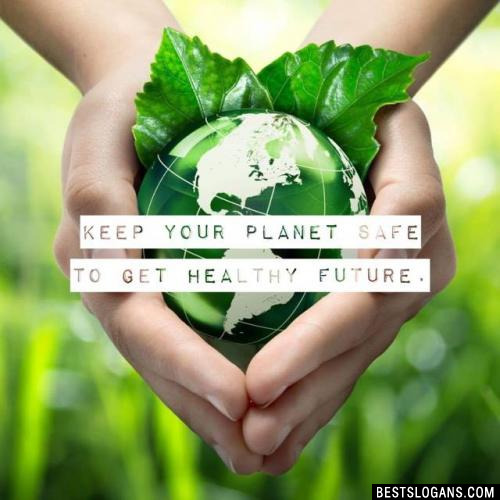 Keep your planet safe to get healthy future. 18 Green earth, clean earth should be our dream first! 19 Lets plant more trees and make our earth green and clean. 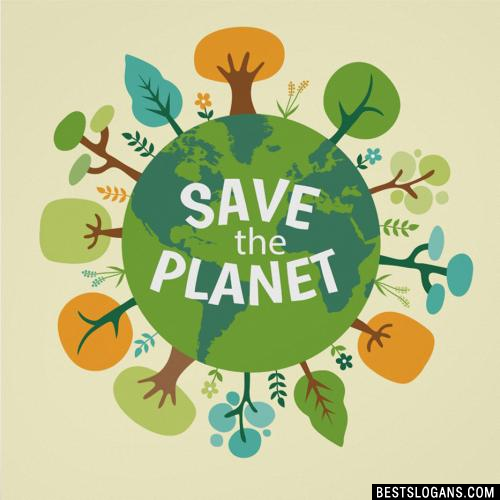 20 Saving of earth is the first and foremost responsibility of everyone, just do it! 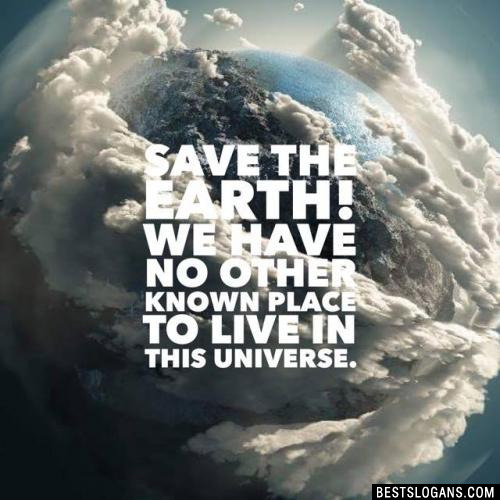 Can you think of a good Save Earth Slogans In English we're missing? Or come up with a clever one of your own. Please share below.